When I started this blog I was confused by people who said they wrote their blog as a Journal. I always thought that a journal would hold my deepest thoughts. But as a grow as a family and listen to the many talks and lessons in church about keeping a journal, I have to look at things in a new light. I need to keep a journal to help preserve my family’s precious memories that we create daily. I want a way for my children and posterity to look back on our lives and see how much we love and appreciate them. I get it now. I am already doing that in the blog, and I will just now print out all my posts on photo paper and put it in out family’s journal I plan on making. I want a journal that all of us can write in when our children get older and share their special family and personal experiences. I now just need to work on my own personal journal, baby steps…baby steps. 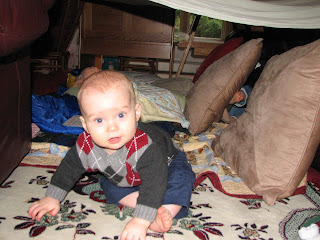 We had our Great Indoor Camping Adventure. 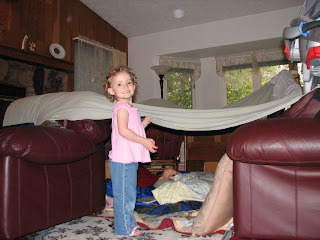 We built a tent in our living room, and slept in it all night. Well, Isabelle and I did, Abinadi joined us after his midnight bottle. Uriah was still in quarantine up in our bedroom. It was a lot of fun! I also learned that Isabelle did inherit some of my genes and talks in her sleep! She freaked me out halfway through the night crying in her sleep crying about her not wanting her puppy/shopping cart (I still don’t know what she was saying) taken away. We had a whole conversation with her still asleep and I finally calmed her down by telling her we will talk it over in the morning and she immediately laid back down dead asleep. Since we didn’t get to do our original birthday camping plans we played up the few things we did have. We made Hobo dinners and Isabelle got to be very excited to keep a secret from me about the trick candles they bought for me. She went around all evening saying she couldn’t tell me, Daddy said she can’t tell me, it’s a secret! It was adorable to see how much she wanted to tell me, and I just had to keep encouraging her to keep the secret. 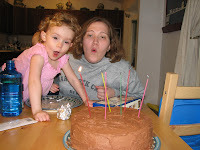 That’s why I look so dorky in the picture, we were playing up the fact that I couldn’t blow the candles out and needed her help. She loved every minute of it. 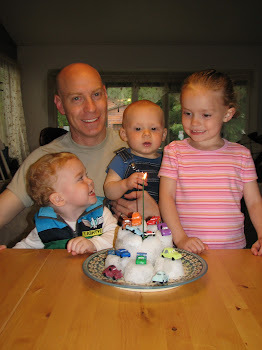 I’ve learned that as you grow as a parent you don’t make your birthday and other event plans to just please yourself, but more often so that your children can see how important it is to make other’s feel loved and special and have the opportunity to show their love. I am certain that I have mentioned before that I was afraid that Abinadi would become a climber. Well, my fears have officially come true. Anything that looks like steps, he climbs. We found him one morning climbing on his sister’s stuff to get onto the fire place. All this done so that he could crawl over to the CD player. He loves music! He will stop everything when he hears music and start dancing. 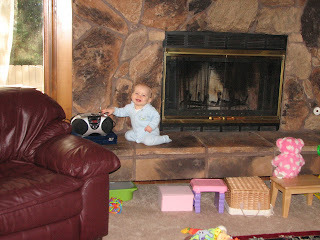 Once he realized that we wouldn’t allow him to play with the CD player, he was content to dance and clap to the music. He also loves cheering for himself, so he will clap and then sign yeah whenever he is happy with himself. 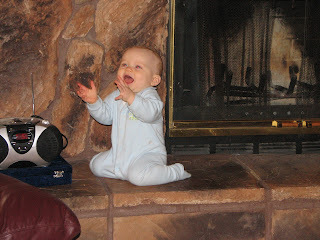 And let me tell you, he was very happy with himself for climbing up on the fireplace! Isabelle is sometimes too smart! I had to include this picture of Isabelle. She found this outfit of Abinadi’s and wanted to wear his shirt. I told her it wouldn’t fit and she had to prove me wrong. So she put it on. She was a little shocked to find it wasn’t a shirt but was excited that it was like a onesie. 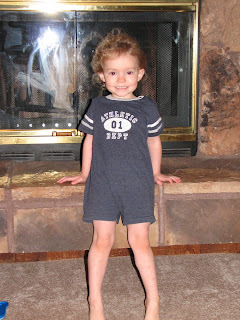 Now you all can see that my 3 year old can fit into a small 24month outfit! Sounds like you had a fun time camping! Hey, there is a place online where you can download their program for free and make a picture story book of your blog, and I didn't think that it was that expensive at all, I will look it up and get you the info. Love Ya!